Rosa Rankin-Gee’s wonderfully accomplished debut novel The Last Kings of Sark explores a friendship triangle developed over an intense summer on Sark island with repercussions that last for years. Emma Young catches up with her. 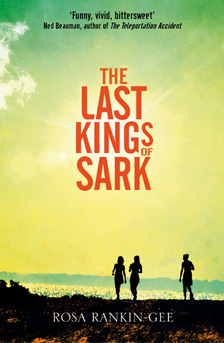 The Last Kings of Sark won Shakespeare & Company’s inaugural Paris Literary Prize in 2011. Extremely-belated congratulations – I suspect this feels like a long time ago now – but could you tell us a little bit about your writing process for the book? While I was on Sark, I filled one and a half notebooks with things I had seen – scribbled down at high speed and in appalling handwriting – and, in my head, bashed out a very basic plot. I say bashed out, because the story as it stands is miles away from the original idea. (The original featured a long-distance speedboat chase. It’s basically gone from Speed 2 to My Summer of Love.) When I came back from Sark, I moved to Paris for a job working as a receptionist at a tiny property company off the Champs-Elysées. I had to open the door for guests and be queen of a Nespresso machine but apart from that, they let me write. I lived off lentils, but I had Fridays off and I managed to break even. I owe everything to the prize though. Whenever I thought the book was irredeemably awful and that it would be rude not to stop, I’d get a piece of encouragement. It was longlisted, and then shortlisted. Without those bursts of support, I don’t know if I’d have finished. Even a novella can feel like an ultra-distance marathon. I’m now freelance, so I’d like to say I write in cafes. I do. I try to. I like it – the white noise of other people’s conversations, the fact that if you pay for coffee you are obliged to use the time well. Often though, I frustrate myself and stay on my sofa. It’s a great sofa and I don’t want to knock it, but it’s not healthy to stay at home all day, and, for me at least, it’s not half as productive. In other words, I’m still learning. Did you build up the novel from snippets of ideas, plan the structure before putting pen to paper/fingers to keyboard, or somewhere in between? Somewhere in between. Ideas are sketched and initially feel contrived, but somewhere along the line my mind usually takes a leap of faith and starts to believe in the chess moves I’ve assigned to the characters. If it doesn’t, something is wrong and I’ll change it. About the pen/paper/fingers/keyboard (the modern version of rock, paper, scissors, stone?) – I write easier bits on Word, harder bits by hand, and do the bulk of editing on printouts. Did you let anyone read your work-in-progress? Unfortunately, yes. I am not one of those writers who produce a tidy first draft. I write the word ‘SOMETHING!!! !’ in between sections of text that I want to later bulk out. Someone once told me that the only writing is rewriting. I take great comfort in that. You put in the time, build up the words, and you make the stone. It doesn’t matter how ugly and ill-formed that stone is, you can hopefully sculpt it into something better afterwards. You worked as a private cook on Sark, as Sofi does, and yet I felt as though you balanced the voices of the three protagonists expertly, particularly as the narrative voice moves around. How did you build the characters and manage the different strands as you were writing? Are the descriptions of all the locations in The Last Kings of Sark based on personal experience, or are some pure imagination? Some are pure imagination. Others are Google map-ination (the Le Havre scenes, for example). But lots take settings and images from real life. Always reordered and enhanced, edited, stretched or squashed into something new. Can you describe a perfect weekend in Paris for us (just to make us sick)? Waking up without an alarm, wandering to a good boulangerie with bed-tumbled hair and flip-flops, coming home to coffee. Going to the market and seeing the herb man in his fur hat. A walk to the top of the folly in the Buttes Chaumont and then down to the canal for a late lunch (here’s where I start plugging my friends’ businesses) at the Sunken Chip – Paris’ first fish and chip shop run by two lovely English boys, James and Mikey. Later that evening, cocktails: YOLOs at Mary Celeste and Guêpe Vertes at Candelaria. I’d spend Sunday south of the river. A show at the Grand Palais, a walk along the Seine to Shakespeare & Company, and then a longer walk via the Jardin de Luxembourg to see a film at La Pagode, a dancehall-turned-cinema in a 1986 Japanese pagoda. The seats at the front are higher than the seats at the back – it’s topsy-turvy and wonderful. For the record, I would never ever do all of these things in a weekend. Last weekend, for example, we spent all Sunday at a friend’s house, drinking ginger tea, eating pizza, watching Homeland and playing Settlers of Catan. Do you come back to visit London often? Have you noticed how the literary scenes of the two cities compare? I do come back to the UK a lot, but often I go straight to Ramsgate, where my parents now live (they just moved; I spent my youth and childhood in Kensal Rise). Ramsgate, a.k.a. my new favourite place, is on the Kentish coast. It’s a curious mixture of golden sand beaches, junk shops and extraordinary sweeping crescents of seafront Georgian architecture. I love it. There is only one bookshop and I am actively glad that the literary scenes of Ramsgate and Paris do not compare. Ramsgate, and the sea, is a perfect place to get perspective. It’s not giving too much away (I hope) to say that there’s a pivotal moment and very much a ‘before’ and ‘after’ in the book. Why do you think the relationships and experiences we have when we’re young are so vivid and long-lasting? Because it’s the first time? Repetition dulls memory, or at least piles up and makes everything blurry. The thing is, though – how long do these relationships and experiences actually last? From my own perspective, I wrote about a lot of the feelings in the book because I didn’t want to lose them. Having well-known authors as parents* could inspire you or put you off for life, I’d imagine. Why do you think it had the former effect? I think to say it inspired me is not quite right – I mean, yes, it did, and they’ve always encouraged me, but I think it’s also a lot more pragmatic than that. Lots of people don’t see being a writer as an option. With two writer parents, I obviously did. But I also didn’t see it as being an easy option. Since I was a kid, I’ve seen the house darken in the aftermath of a bad review, I’ve seen how hard that world is, how arbitrary. It’s a strange thing to stomach – talent and hard work are not at all directly proportional to success. It’s not like that so much in other career paths. Even the term career path is wrong; there is no normal career path in writing. Of course though, and this is what stays and will stay: I see that my parents are happy and fulfilled and that their lives have made a difference. A friend’s dad recently asked his daughter “What do you think of my life?” It can be quite a sad question. But if my parents asked that, my answer would be easy – I can only hope I do life as well as they have. Did you read and/or write a lot as a child? I was definitely not the most natural reader as a young child. First off, I didn’t learn to read for ages, because instead of actually processing the words on the page, I would just memorise the story as my mum read it. I acted reading for nearly a year. After that, I often forgot that reading was something I enjoyed. I think my parents were worried. “But Aline/any other of my friends likes reading…” they’d say plaintively. With hindsight, they had nothing to worry about. As a kid, I was weird in lots of ways. I only used to eat white food (bread, pasta, potatoes, chicken with no sauce) until I was 16 and now I will eat anything. Tastes change. Who else inspires you? I’m especially curious in terms of style, as your writing is beyond beautiful and accomplished for a debut. That’s exceptionally kind of you. It all comes from my own mind, I owe nuffin’ to no one! Not really. I read a lot (now). Most recently: Steinbeck, Smith (both Zadie and Ali), Baldwin, Munro, Timothy Egan, and I just reread Zoe Heller’s Notes on a Scandal. I also think the New Yorker is an amazing window into so many things – at first I only read the fiction, but now I prefer the features: Mongolian dinosaur bone smuggling or iron ore mines in Guinea. We battle over it in our house. The biggest inspiration though is surely the world, and what happens. I write the world in my head as I see it. If I’m looking out of a plane window, I will think about what that could be in words, always. I don’t know yet. If someone likes the book, and it makes them feel something, then they are the person I wrote it for. I also do copywriting, so at this very moment I’m working on campaigns for a beauty brand launching a slightly bizarre face cream in Asia, and a luxury cigarette brand launching a product in Kazakhstan. If emoticons were an acceptable way of communicating in an interview I would use this one: :-/. Apart from that, I am writing novel two. I have 40,000-odd words now, but I also think I’ve made a few grave false starts. It will take as long as it will take – I want to do it right. The Last Kings of Sark is published by Virago. Read more. 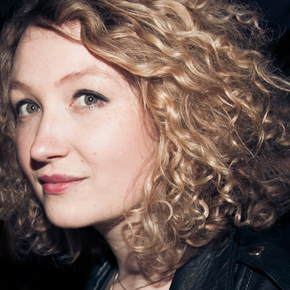 Rosa Rankin-Gee has previously published short stories and was selected as one of Esquire magazine’s 75 Brilliant Young Brits in 2010. She co-hosts The Book Club at the late-night cocktail bar Le Carmen in Paris and is editor-in-chief of the journal A Tale of Three Cities.